I finally stopped dawdling and bought the faithpermeatinglife.com URL. No worries; any old bookmarks will still work fine, and the RSS feed should keep on working as well. So now when you tell your friends about this site (and I know you do...) you don't have to remember my weird username to get the URL right. 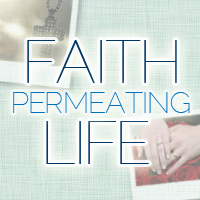 There is now a Facebook page for Faith Permeating Life! Since at least one person said they would "Like" it if I made one, I decided, what the heck. At first there will probably be a lot of overlap with what's on my Twitter feed (new posts and links to interesting articles), but I'm hoping to use it to ask and receive questions as well. So join the conversation! Finally, I've got a bunch of post topics stockpiled away, but I got to wondering what kind of things YOU like reading about most. You can see at the top of the page that my posts are divided into seven different categories. I'd love if you could take 30 seconds and answer the 2 questions below! If you can't see the form, click here to answer the two questions. Thank you! You all rock! Hope you're having a fabulous weekend. 'liked'! Good idea to ask for input, but don't let other peoples opinions drive your blog. It still has to be about what YOU want! Thanks for the Like! Don't worry; it's pretty rare that I let other people's opinions totally drive what I do, especially in a space like this. I just want to have a better sense of my readership, of what people are coming here for. Oh jeez Jessica, please don't make me pick! :) I like everything! Well, that's good :) I'm finding that people really do like a mix of everything, so that makes me feel like I haven't been boring people too much with my random assortment of topics, haha. Thanks for taking the survey anyway!